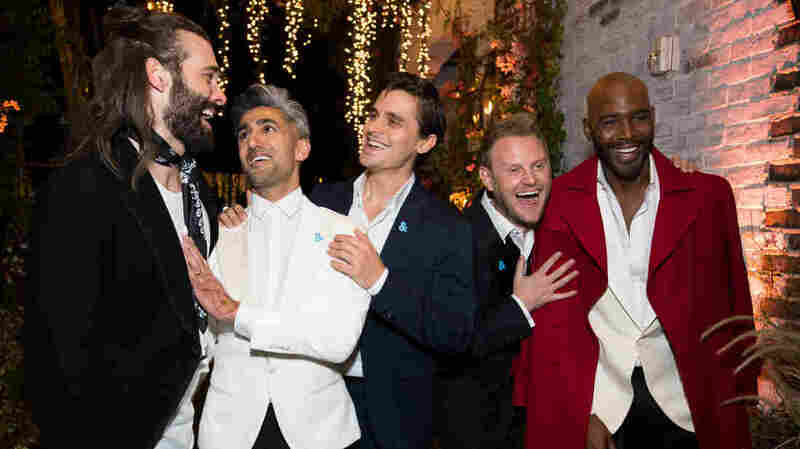 Queer Eye Reboot Hits Netflix: A New Fab Five For A New Era David Collins, creator of Netflix's Queer Eye talks about how the reboot is different from the 2003 Bravo show, Queer Eye For The Straight Guy. Jonathan Van Ness, Tan France, Antoni Porowski, Bobby Berk and Karamo Brown attend the after party for the premiere of Netflix's Queer Eye Season 1 at the Pacific Design Center in Los Angeles on Wednesday. Queer Eye for the Straight Guy ran on the Bravo TV network from 2003 to 2007. The show focused on a group of five chatty, personable gay men, called the "Fab Five," as they gave a make over to a straight man who needed help getting his life back on track. Each member of the Fab Five specialized in one of the essential elements of style: design, personal grooming, fashion, food and pop culture. The show was a surprise hit as it aired in a country that was still working on bringing LGBTQ culture and issues into the public's consciousness. Fifteen years later, LGBTQ acceptance and rights have come a long way. Now, Queer Eye is back with a new cast, mission and platform — now streaming on Netflix. Queer Eye creator and producer David Collins spoke with NPR's Michel Martin about how the reboot of this TV show is different from the 2003 original. Well, 15 years ago in Boston, Massachusetts, I was at an art gallery with Michael Williams, my business partner and husband, at the time. And we walked into an art gallery where everyone was looking at art and drinking their wine and eating their cheese, and there was this kind of hush that came over the room. A woman in the middle of the room just started laying into her husband, literally, like, berating him: "Look at you! Why can't you look like these guys?" And she kept pointing across the way. And, just like out of a movie, everyone got really quiet and she started talking louder. And these gentleman from the corner, dressed and looking great with their wine, came across the room, surrounded him and said, "Hey! Woah, woah, woah!" And they started fixing his hair and tucking in his shirt and fixing his belt and his pants and was like, "No, doing great! He just needs a little help! A little zhush, a little this, a little that." And I turned to Michael and I said, "Did you see that? That was like queer eye for the straight guy!" And as the title came out of my mouth, I realized I gotta go home and figure this out. Sure, we definitely ... early on, we're like, "Oh, you're playing into the stereotypes. You know, not all gay men know how to cut hair and do flowers, and decorate." And the reality is, we were playing into the stereotypes because these five men were experts in their field, each one of them. And it just so happens that if fashion, grooming, interior design, culture, food, and wine happens to have a serious influx of gay men, it's the truth if it did! And it was a great way to, kind of, bring those two worlds together. So, Ted Allen, our original food OG fabber, used to address it all the time, saying, "Indeed, these stereotypes were real and we stepped into them and embraced them and also, kind of, empowered the word 'queer' at the time as well"-- took that back from the negative lexicon and brought it back to the world with new eyes, a new perspective. It wasn't necessarily the impetus for it, it happened to be that we stepped into this time where, indeed, this conversation needs to move forward again and definitely be much more aggressive. As far as the actual moment of why now, we did it because there's a whole new audience. A lot of folks didn't know it from 15 years ago, and we get to show it to a lot of people. It's a great show, it's fun! You have fun going on these journeys with each one of our heroes and now, the conversations are deeper. You know, our Fab Five — we get to see them as wholes and they're having dialogue with these guys that are ... it's quite interesting, you know? We have policemen — a Trump-supporting policeman — we have a self-proclaimed kind of, you know, "country boy," an amazing African-American who's coming out to his family. Definitely, getting out of New York was a big part of the decision because, you know, 15 years ago, it was one thing to walk into a fancy store on Madison Avenue and redo someone — you can do that. But we wanted to come down South, come into the red states and know where we're going to meet very different guys, right? I'm from Ohio, from Cincinnati, Ohio, and I know what it's like, you know ... we don't live on the coast. When you're down in the South or in the Midwest, dialogue and conversations are a little more iffy and intense about this, so we decided to head down to Atlanta and each one of our guys comes from a different small town in Georgia and those towns, we get to see as each part of the stories as well. NPR's Liz Baker produced this interview for broadcast. NPR's Adhiti Bandlamudi produced this story for the Web.